The CON-TROL-CURE UV SPOT GUN DELUXE is designed for small area curing and small part applications of UV or visible adhesives within the 365-500nm range. The unit will not overheat, even with continuous exposing cycles. 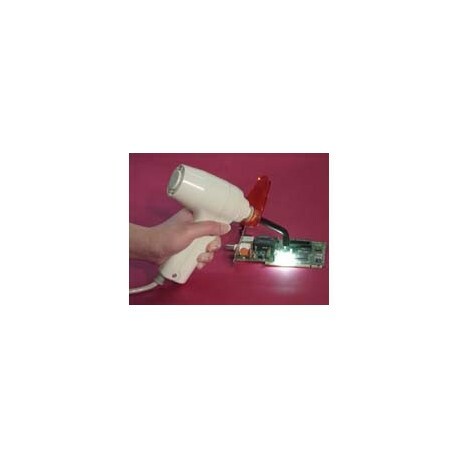 This highly versatile system can be handheld, mounted on a table or wall. This reliable, compact curing unit is perfect for spot/larger area (10 cm x 10 cm) curing. The precision optics offer exceptional depth of cure. It generates a high intensity UV output of 70mW/cm2 and the UV peak is at 365nm. After depressing the switch, the cycle time begins and the beeper sounds every 10 seconds. One squeeze of the trigger starts the cycle time. After the designated exposure time has been reached, an audible alarm sounds as the light shuts off. The digital timer can be set to cure from 10 seconds to 9 minutes in 30 second intervals. There is a trigger activated cycle interrupt that stops exposure when the full preset cycle is not required. The unit has a quiet, high CFM cooling fan, which starts when the lamp is activated and stops automatically 3 minutes after final exposure. 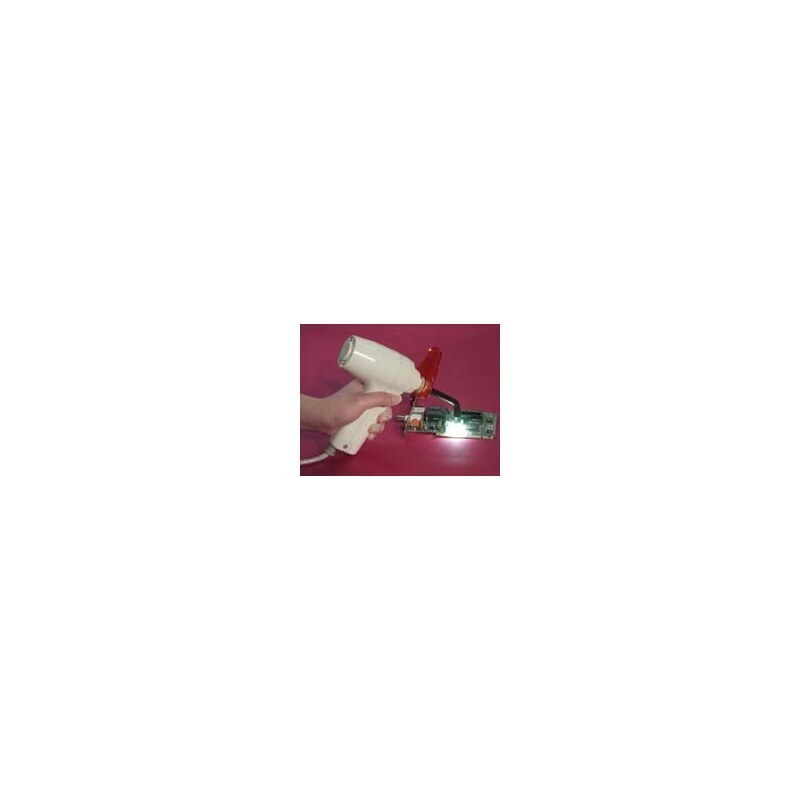 The UV SPOT GUN DELUXE is equipped with a 8 mm x 60 light guide and an extended life (100+ hours) lamp. Optional extra light guides are available by special order and can be purchased separately: 3 mm x 90, 13 mm x 80, or 13 mm straight. Carries the CE mark. NOTE: PLEASE SPECIFY REQUIRED VOLTAGE AT TIME OF ORDER. IF NOT SPECIFIED, INSTRUMENT WILL SHIP AS 110V 60Hz ONLY.